On October 26, I had the opportunity to view a screening of a documentary called “Man Made” at NewFest, New York City’s LGBTQ+ Film festival. Executive producer Téa Leoni and director T. Cooper created this documentary that took you through the lives of four transgender bodybuilders. Each of the four men were at different stages of their transition, which made it very interesting to watch, as each of them had immensely different experiences. Through each story, you were taken on a journey, both mentally and physically, as they all worked towards their goal: to compete at Trans FitCon. Trans FitCon is the only all trans bodybuilding competition in the world. The experience as a whole was amazing. I cannot stress enough the impact that the documentary made on me, as well as everyone watching it. The entire audience was moved to tears throughout the screening because of it’s rawness. Director T. Cooper is a trans man himself, which allowed for an even more authentic story because he understands what it means to go through that kind of transition, as he experienced it too. After the screening, T. Cooper, Téa Leoni, and Mason (a subject in the film) went up onto the stage to answer a few questions. T. Cooper said that often times, when someone tries to tell a story about a subject they don’t necessarily identify with, it becomes really difficult because of a “film” acting as a barrier between the truth and the story. 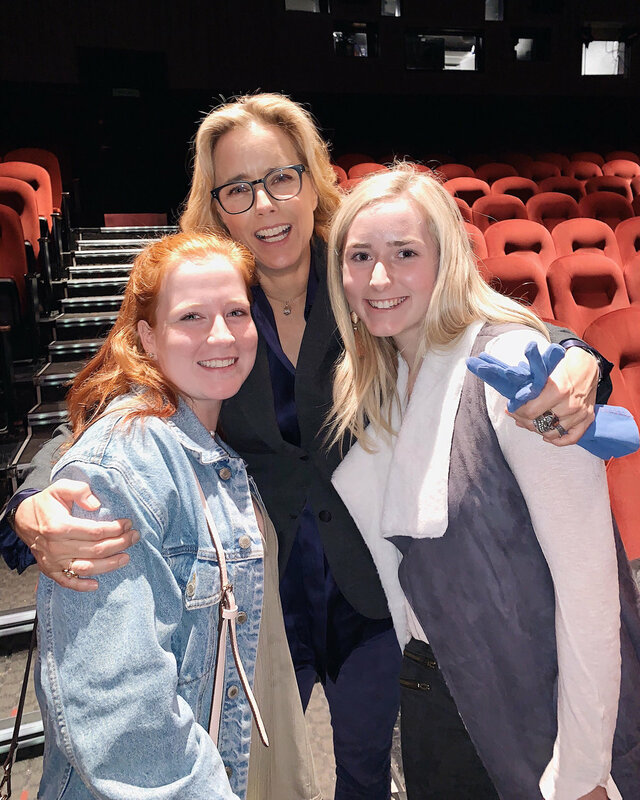 To bounce off that answer, I asked what kind of advice they would give to student filmmakers who want to make stories that matter, without getting that “film.” To answer, Téa Leoni said “To be a powerful filmmaker, you have to be willing to be open about what you find and know that it’s not about you. It’s about finding the truth,” later on saying to me personally, “These days people are too scared to be curious, they just want to be right.” This quote has really stuck with me and inspired me to dive into my own direction for storytelling and to create films that I believe to be important. Afterwords, I was lucky enough to grab a few words with actors, Tim Daly, Erich Bergen, Sara Ramirez, and Téa Leoni. They all had even more positive words about the importance of young people finding their voice and creating films that they are passionate about. Every single person there, was so inclusive, willing to learn and discuss the film’s purpose, and share their experiences. Man Made went on to win Audience Award for a documentary feature at NewFest, and has won 10 other awards at different film festivals around the country during 2018. If you ever get the chance to see it, do it! The film creates conversation and that is one of the most important things we could ask for. The overall feeling of my experience at NewFest was overwhelming inspiration. I had never had that one thing that made me think to myself, “this is what I am meant to do” until now. For those of you reading that are an aspiring filmmaker, get to film festivals!! Experience different kinds of filmmaking and always be willing to learn and get better. For everyone else reading, get to film festivals!! You never know what story could change your perspective.